Be a Wishmaker! Together, we create life-changing wishes for children with critical illnesses around the world! Make-A-Wish creates life-changing wishes for children with critical illnesses. We seek to bring every eligible child's wish to life because a wish is an integral part of a child's treatment journey. Research shows children who have wishes granted can build the physical and emotional strength they need to fight their illnesses. granting organization, serving children in more than 50 countries worldwide. Be a Wishmaker and create-life changing wishes! 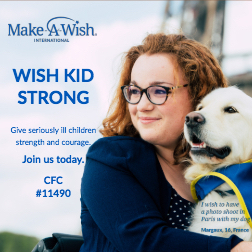 There are still thousands of children diagnosed each year with a critical illness whom Make-A-Wish is trying to reach through medical outreach and established global infrastructure that supports and delivers life-changing wishes. To be able to grant the wish of every eligible child, we need your support in our pursuit. Donate now - help grant wishes and transform lives.